To say that Brown’s Chicken, a fast-casual chain with 29 locations in the Chicago area, was hit hard by the recession would be an understatement: Owing more than $10 million to creditors, the company filed for Chapter 11 bankruptcy in 2009. But last year the failed company was purchased by Pop-Grip LLC, and under the new management team, sales bounced back to pre-recession levels, with $14 million in revenues for 2010. Today, the company has three new franchises in the works. The converse is also true, he says: As people are exposed to Brown’s Chicken products at catered events, they’re more likely to visit the restaurant locations. As the economy recovers, so does the catering business, as business travel, sales meetings and professional conventions increase. Non-business events—weddings, birthday parties and the like—are gaining steam as well. And while the catering industry grew by 9 percent in 2010, according to market research firm Packaged Facts, Brown’s Chicken increased catering revenues by 10 percent during the same period. The chain plans to double that figure in the next two years. Brown’s Chicken advertises its catering service heavily to both business and individual catering customers, and incorporates its catering logo and tag line— “Brown’s catering is as easy as 1, 2, 3”—in its ads. Last winter, the company also launched a $25,000 ad campaign promoting holiday office catering and using a re-mastered version of its 1989 TV spot, which featured then-unknown Steve Carrell, now a movie star. The spots invited customers to nominate their bosses for a “world’s best boss” competition, and the winner received an office party catered by Brown’s Chicken. In the future, the chain plans to advertise its catering services even more prominently, with flat screen TVs featuring images of catered events and cuisine on restaurant walls. 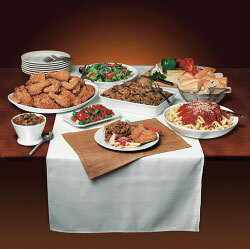 Brown’s Chicken also plans to boost catering sales by revamping the ordering process with an easy-to-use online system. Customers will choose menu items and quantity, and the system will calculate a price. But, says Kennefick, “the customer is putting a lot of trust in you for these events. It’s important to maintain a personal connection.” So after the order is received, an employee will call the customer to verify the order and discuss event details.